Due to these changes, this "Beta Version" of Book One: Descent is no longer the "official" version of the podiobook. Please visit the 7th Son: Descent (The Print Edition) page to subscribe to the definitive version of the story. THE STORY Three weeks ago, the U.S. president was murdered by a four-year-old boy. Today, seven men stare at each other in a locked conference room. Kidnapped and brought to this underground facility, the strangers are sitting in silence, thunderstruck. Despite minor physical differences, they all appear to be the same man, with the same name … and the same childhood memories. Unwitting participants in a secret human cloning experiment, these seven "John Michael Smiths" have been gathered by their creators for one reason – to capture the mastermind behind the president's assassination. Their target? The man they were cloned from; the original John Michael Smith, code-named John Alpha. Soon our heroes – John, Jack, Michael, Kilroy2.0 and the others – realize the president's murder was merely a prologue to Alpha's plans. As the mystery deepens and the implications of Alpha's scheme are slowly revealed, the clones decide to stand against John Alpha. The outcome will unearth a conspiracy larger than they could have ever imagined. Descent is the first novel in J.C. Hutchins' 7th Son thriller trilogy. 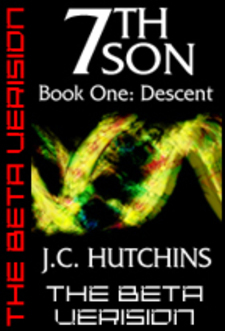 We will send 7th Son: Book One - Descent (The Beta Version) to your Kindle at . 7th Son: Book One - Descent (The Beta Version) has been sent successfully to your Kindle!